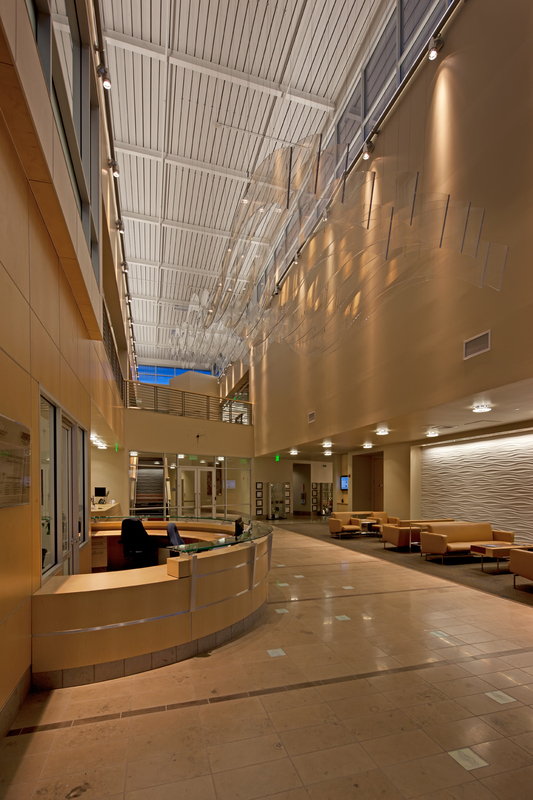 Ed Asmus Photography captures Central Valley, AIA award for Williams + Paddon Architects for the Sacramento Sewer District Offices for 2011. This job was one that really had my back pushed against the wall, the forecast calls for rain. Short deadline, huge weather delays and only two weeks to complete the photography. A short window to deliver for this awards submittal, two weeks of weather delays. This series of exteriors were done the first night out on a Thursday. In all of my 30 years plus in Architectural Photography, it rarely happens to have a clean parking lot during the week with no cars. No this is not fur-low Friday, just plain luck to get the cars out of the parking lot. Facilities Managers off site and not able to gain any access for Friday, Saturday, Sunday & Monday, let’s say I am getting worried, losing time, which I am short of. Excellent weather Tuesday and Wednesday daytime shots and additional exteriors were completed at dusk. We wanted to see the stairwell lighted with maybe a person in the stairwell for the final illustration. At dusk we noticed three lights burned out in the stairwell, this tied our hands for a short deadline, trying to get the lights replaced, it was something we just had to work around. I was able to double back at pre sunrise on Wednesday morning to capture the rear of the building. I am now feeling good the exteriors are completed and meet my standards and my client will be happy, it’s time to move into the interiors. Dusk is for a very short time and multiple nights had to scheduled to achieve, all of the final compositions. Light is everything, there are no short cuts, it all takes time. The night before major clean up, back at pre sunrise to be able to have the blue light coming thru the window. Again a separate night to be able to shoot at dusk, to get that contrasting blue light out the windows, that’s the magic time. Added shot not in the scope of work, but something that I wanted to include. Added shot not in the scope of work but something I wanted to include. It’s always nice to give your client more when you can deliver. This interior was the only area which posed major problems. Facilities had my shoot list and this was set for dusk. I arrived early to start major clean up. The area in the foreground had major clean up to do to make this a clean illustration. Arriving early, Linda was not around and the short deadline, I had to try to clean her area enough to make a clean illustration. I was able to achieve a clean shot and I wanted the area cleaned more but had to stop. As it turned out, sometimes you are not able to put everything back into the exact spot and it violates the person space. I got a call form Linda that she was upset, all that I could do is appologize and be sincere, which was done. This rarely happens but you have to get the shot and have to be accountable for your actions. I am happy with what was produced under extreme conditions, call me the Postman, Ed Asmus delivered.